Besides English and Irish heritage, many people in the United States have a German heritage. It many be in only one family branch or in nearly all the branches. It might go back centuries since many with a German cultural background came to United States while it was still an English colony in the 1700s to get a new life in a new land. Using the free, ‘Many Roads’ online site titled ‘German Immigrants 1850s to 1890s‘ you just might locate some additional information on some 19th century German ancestors. There are five sections, each for a decade beginning 1850 and going through the late 1890s. Have some possible German ancestors’ names and dates from your tree before beginning. You might not know when an ancestor arrived, so going through each decade might need to be done. If you can narrow it down, such as you know for sure a German relative was living in New York by 1880, check their immigration for 1850s-1870s. Select a decade and at the top is a search box. Place a surname or a relative’s given and family name and a selection will appear. Look at the name (remember spellings can vary), the date of arrival, and where they came from and which port in America they arrived at. If you locate a possible relative, click on that name to view the full file information. Whatever information was on the ship’s manifest will be on that records, including occupation, reason for coming to America and if any other relatives were traveling with that person. There might be another ancestor you didn’t know about this way. Check at the top for ‘contributors’ for the listing of sources used. Once you find the ship’s name go to the section at the top for ‘ships’. In alphabetical order are ship names. Here it will give the number of passengers on that specific voyage your ancestor was on, where it traveled from and the places it was traveling to. Click on the arrival date and the full passenger list will appear. Here might be some other ancestors with different names you were not aware of on board. 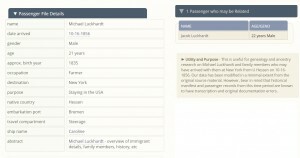 Just for the 1850s there are some 461,811 German passengers listed. 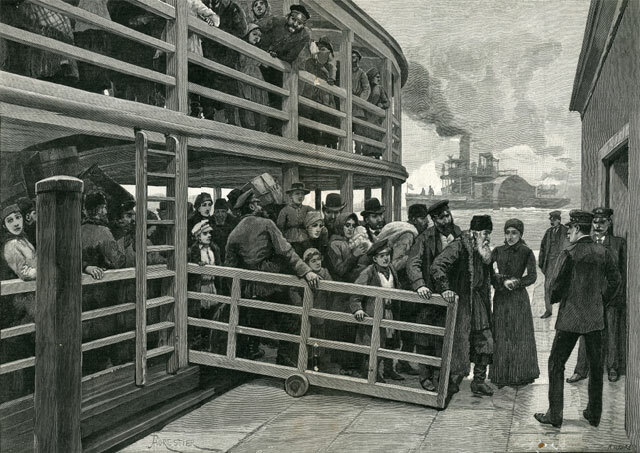 For 1890 to 1897 there were 320,702 passengers. 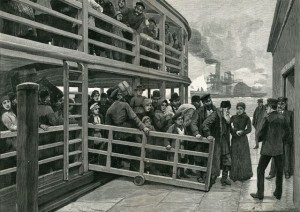 Site: German Immigrants 1850s to 1890s. Photos: View of the record for 1856 for Michael Luckhardt and print of immigrants by Maggie Land Blanck.